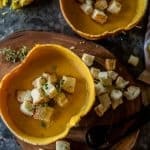 This rich and creamy Pumpkin Beer Cheese Soup gets the seasonal treatment, and the homemade herbed croutons add a happy crunch to this satisfyingly easy meal! In a large bowl, toss the bread cubes with the oil mixture, coating as evenly as possible. Spread the cubes on the baking sheet and bake for about 8 minutes. Sprinkle the croutons with the grated Parmesan, then bake for 8-9 more minutes, until golden brown. Sprinkle the croutons with more salt if desired, then serve on top of the soup. Soup recipe heavily adapted from Epicurious. Crouton recipe slightly adapted from Epicurious.